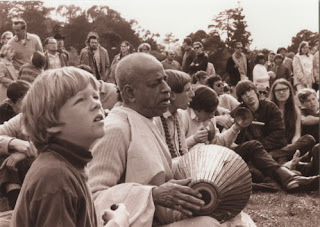 I have worked, off and on, on writing an account of the events that brought Krishna consciousness into my life. I'd like to offer here a draft of the first part of that article. After much more than fifteen minutes, one of the announcers from the local underground FM radio station, which promoted the concerts this weekend, announced that Jimi wouldn’t be able to play that night, but if we brought our ticket stubs on Sunday night, he’d perform for free. In the meantime, which might have been an hour or so, I heard a persistent sound from just outside the Shell: ching-ching-chiiiing, ching-ching-chiiiing, ching-ching-chiiiing, on and on. Sometimes it went faster, sometimes slower, but it never stopped during the entire break. As we left the Shell, what we found were perhaps the most exotic folks I had ever seen. There, under a large, rainbow-colored banner with the Hare Krishna mantra, were Govinda dasi, Sudama, Turiya das, and another young woman, playing karatals, a guitar, a rather exotic-looking drum, and chanting, “Hare Krishna, Hare Krishna, Krishna Krishna, Hare Hare, Hare Rama, Hare Rama, Rama Rama, Hare Hare.” As the crowd streamed out of the Shell, it gathered around the devotees, young people clapping, swaying, and chanting along. As I heard the mantra, I found it oddly familiar. Sure, I had heard the song from the tribal rock musical Hair on the radio, but this was different.